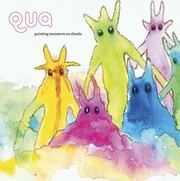 Qua (aka Cornel Wilczek) starts his latest audio outing with a simple, short statement of intent in the form of ‘Painting Monsters’. It’s an introduction of sorts, both suggestive of the sound textures to be encountered on this disc, but equally acting as a guide to the overall mood of the compositions on this record. Qua’s developed a fine sensibility to his work, an understanding of the way that melody, rhythm and texture can be used in creative ways to illustrate a theme or feeling. Tracks like ‘Night Sailing’ have an amazingly visual quality to them – they ring out with conventional melody interplays, but like Tortoise and other groups with strong layering abilities, the quality of each section of the piece working with and over the top of each other generates a unique phrasing that heralds strong tension and release. The same can be said of pieces like ‘Happy Domestika’ and ‘Luckybuster’ which each carry a formidable barrage of divergent sounds. This disc has been picked up by Headz in Japan and one listen through will tell you why – a well conducted and composed piece of work here, electronics riddled with personality and expression.